It’s time for the MysteryLAN again! 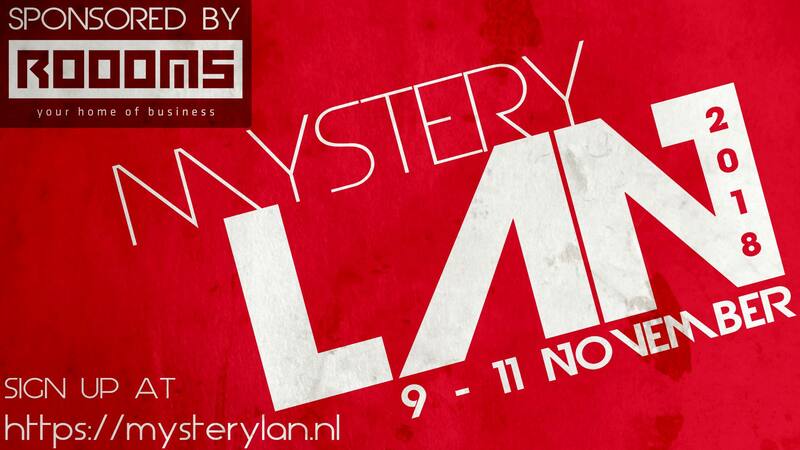 On Friday November 9th, from 18:00 onwards, you are welcome to take part in the MysteryLAN for 3 days of GAMING! The event will last until Sunday afternoon, November 11th. During the event we will have several competitions, which will be revealed at a later date (keep your eyes peeled!). Of course participation in these competitions is not compulsory and you are free to play any game that you like at any time of the day! The goal of the weekend is to have fun with each other! We have been working hard behind the scenes to make this LAN the best one yet! You don’t need to bring your own internet cables. Please note you cannot reserve a monitor this time. This time, MysteryLAN will be held at our sponsor, ROOOMS Maastricht, located at Boschstraat 21. ROOOMS is a community for entrepreneurs. Everybody can join, but most ROOOMS members are part of a dynamic mix of innovative start-ups and hardworking companies. There are enough possibilities to get in touch: network events, interesting lectures and spontaneous meetings in their lounges. Or near the coffee machine! €15 for members or ROOOMS tenants. Please read all rules and conditions for participation at https://www.mysterylan.nl/rules/ before signing up! So what are you waiting for!? Go sign up before it is too late!